This is Elizabeth's story about the evils of ticks. Being a member of the Over-Fifty set, it's not every day that I experience something completely new. 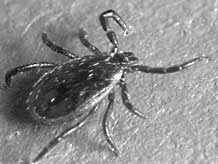 The other day I found a tick firmly attached to my back. I had never before been bitten by a tick. Found one on my clothes once, plucked more than I care to count off our basset hound (you can really tell when the Frontline wears off), but never been bitten myself. How did I get the tick? Our best guess is that I picked it up from our dog while grooming her. I had had my arms wrapped around her while clipping her toenails and the little bugger must have wandered onto me. We had been walking in the local park that morning, and being a good basset hound, she had her nose buried in many little rodent runs in the tall grass. She probably picked it up there. And I picked it up from her. So what DOES it feel like to be bitten by a tick? Well, it didn't really hurt. Within a short time after grooming the dog, I started to notice a slight, dull itch and even scratched it a little. It wasn't bad so I ignored it and continued with my work. The odd feeling continued and several hours later it had grown more uncomfortable. The sensation was that of something pulling on your skin, definitely not as sharp as a pinch. Craning my neck to see, I saw a black dot where the annoying feeling was. My first thought was that I had a mole but then I got a mirror to check it better and, to my horror, I saw LEGS! Eeeek! Presenting a pair of tweezers to my husband, I requested his immediate assistance in tick removal. This little pest had firmly embedded its mouthparts into my back, so he had to pull quite hard. The tick was not ready to leave as it had not yet started feeding (it's body had not started inflating with blood). Trying to pull the tick out, my husband eventually pulled the tick apart leaving the mouthparts embedded. He cleaned the wound, dabbed on some antibiotic lotion and covered it with a band-aid. For several days afterward, the area around the wound was tender, but it quickly diminished and mostly healed except for a little red spot within a week. The first couple of days we kept an eye on the bite, cleaning it with antiseptic and covering it with antibiotic cream and a band-aid. At first, there was a very round white “bull's eye” around the red wound, with redness around the white spot. We wanted to make sure it didn't develop into the red-rash bull's eye symptom of Lyme disease. It's possible that the marks and the tenderness were actually caused by the trauma of the removal process and not the bite itself, it's hard to say for sure. Whatever the case, I healed with the tick's mouthparts still embedded in my skin, and lived to tell the tale. Bed bug bites look a lot like bad mosquito bites. Take a look at the lower drawing (left). 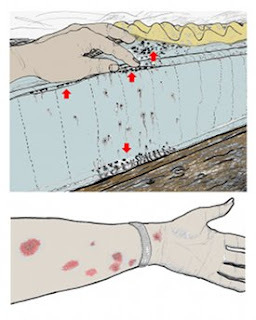 Bed bug bites will generally be red with local inflammation and swelling. The redness is caused by an allergic reaction to proteins in the bug's saliva; again, much like a mosquito bite. There may be multiple bites in the same area and the bites can occur anywhere on your body. Bites will usually itch as well. 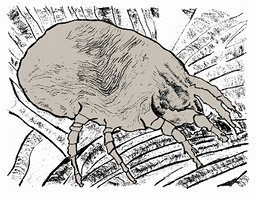 Bed bug bites are self-limiting and there is very little danger of disease transmission associated with these insects (unlike mosquitoes). Bites can be treated with over-the-counter anti-itch medications or antibiotic lotions if the skin is broken by scratching. If you encounter bed bugs in a motel/hostel/inn or other sleeping establishment you should (1) notify the management so they can take steps to control the infestation, and (2) take care not to transport bed bugs from there to your next destination. Bed bugs can travel with you on your belongings such as backpacks, bedding, sleeping bags, pillows, etc. Notice in the upper drawing that bed bugs like to hang out in the folds and seams of the mattress and under the mattress pad (red arrows). The black specks in this drawing are bed bug droppings, mostly digested blood. Rooms that are infested with bed bugs will usually harbor this type of evidence of the bug's presence. See the following links for information about the life cycle of bed bugs and eliminating bed bug infestations. There's also some information about checking a room for bed bugs before moving in for the night.